The closest major hiking destinations around Palm Springs are an hour or more drive away, nearest being the San Jacinto Mountains, the San Bernadino Mountains and Joshua Tree National Park. 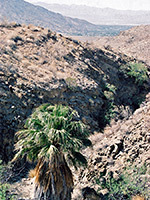 There is little of interest in the desert of the Coachella Valley surrounding the city, but one popular hiking area is located just a few miles from downtown, in the mountain foothills, where Tahquitz Creek and various tributaries of Palm Canyon Wash have carved narrow canyons, all containing year round water that sustains many groves of California fan palm trees. Known collectively as the Indian Canyons, since most of the land is part of the Agua Caliente Indian Reservation, this region offers excellent and varied hiking, over desert hillsides or along the cool, palm-lined gorges. Reaching the Palm Canyon area is easy since the entrance is along South Palm Canyon Drive, the main road through the center of Palm Springs. Driving south, this becomes less busy once highway 111 bends away to the east; then for another mile the road passes more well-kept houses, gated estates and the Indian Canyons Golf Resort, all lined by numerous palm trees and surrounded by lush green lawns. Once into the Indian reservation, the land is in a natural state, the houses more scattered, and the surroundings are grassy, bushy desert. The entrance station is half a mile further, charging (2019) $9 per person for day use, $7 for seniors or military, and $5 for children. Opening hours are 8 am until 5 pm - a pity since in summer the cooler evening hours would make some of the longer hikes more pleasurable. From July to September the canyons are closed from Monday to Thursday. 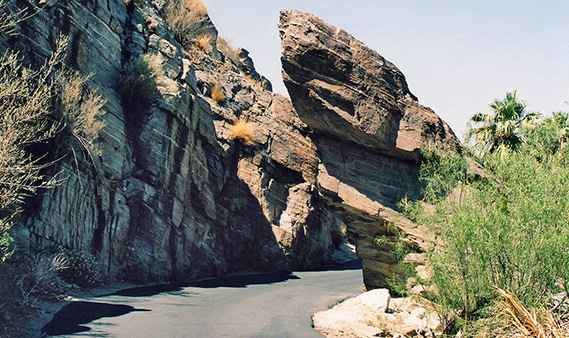 For the separate Tahquitz Canyon area, the entrance is along W Mesquite Ave, forking west off S Palm Canyon Drive a mile north of the CA 111 turning. The fees here are $12.50/$6 for adults/children. Andreas Canyon: Andreas Creek begins high in the San Jacinto Mountains, joining Palm Canyon just south of the Indian Canyons entrance station. A one mile side road ends at a parking/picnic area from where a loop trail follows either side of the creek for another mile, passing many fan palms and other desert plants. Several rock mortars can be seen along the trail, once used for food preparation by the native Cahuilla Indians. 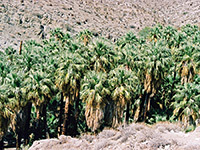 Fern Canyon: Fern is a minor drainage on the east side of Palm Canyon containing a small oasis of fan palms and ferns, reached by a path that starts from the main parking area at the end of the Indian Canyons access road. The full length of the trail is 4 miles. Murray Canyon: The trailhead for the hike along Murray Canyon is the same as for Andreas Canyon. From the carpark, the trail heads south across the side of the main valley, reaching the canyon after one mile, then follows beside the creek for 5 more miles, through many groves of palms separated by short open areas. Murray receives far fewer visitors than Palm or Andreas and is a good choice for a peaceful, all-day hike. Palm Canyon: The highlight of the Indian Canyons is Palm Canyon, stretching 15 miles across the north slopes of the Santa Rosa Mountains. 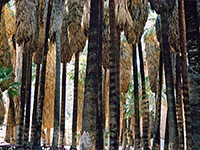 The best section is the first mile as here are found the largest group of California fan palms, viewed by an easy trail that follows close beside the creek. A continuation path follows the whole length of the canyon, eventually joining CA 74 near Pinyon Pines, though most of this is through the barren hills above the creek, while other branches lead to the West Fork of Palm Canyon, and to various sites to the east. 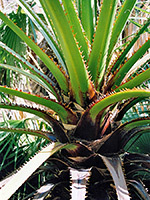 More about Palm Canyon. Tahquitz Canyon: The Tahquitz area is rather more commercialized than other nearby canyons, reflected in the increased price for admission. A 60 foot waterfall (seasonal) is the main attraction, together with numerous pools, smaller falls, Indian rock art and ancient irrigation ditches, though no palm trees. As of 2005, self guided hiking is once again permitted, after the canyon was closed for many years because of damage caused by previous visitors.